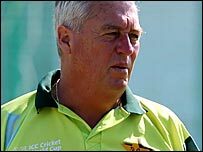 Pakistan cricket coach Bob Woolmer has died of a suspected heart attack after being discovered unconscious in his Jamaica hotel room. The 58-year-old former South Africa coach, who played for England between 1975 and 1981, was taken to hospital but never regained consciousness. "It is very shocking news to all of the team and the team management," said Pakistan team manager Pervez Mir. Woolmer died less than 24 hours after Pakistan exited the World Cup. Mir revealed that Woolmer suffered from a medical condition - but said it was too early to say whether it played a part in his death. "We saw him last night but having not seen him early today two of our officers went to his room and with the help of hotel staff entered. He was found unconscious there. "It is too early to say whether he has suffered a heart attack. We are awaiting medical reports." Woolmer's South-Africa based wife has been notified. He also leaves two children. Pakistan were eliminated from the World Cup on Saturday after losing by three wickets to minnows Ireland. Their preparations for the tournament had been far from ideal. Following the infamous forfeited Test against England at The Oval last summer, two of their leading fast bowlers Shoaib Akhtar and Mohammad Asif, were suspended after failing doping tests. The pair later saw those bans rescinded but missed the World Cup because of injury, something Woolmer admitted had hindered the team. "There are a number of extenuating circumstances in the last six months that have made coaching Pakistan slightly different to normal sides," he said after the defeat by Ireland. The Pakistan team are scheduled to play their third match of the World Cup against Zimbabwe on Wednesday in Jamaica. Spokesman Mir revealed that the match would take place and said: "The Pakistan team will continue its participation in the tournament. We are due to play Zimbabwe and we will. "Obviously the boys are extremely sad, they are very disturbed, they are shocked, it's a very shocking happening. But the boys have to play the match and they will." Woolmer took charge of Pakistan for 10 Test series, four of which were won, with three lost and three drawn. His overall Test record in 28 matches as Pakistan coach was 10 wins, 11 defeats and seven draws. In the one-day game, he took charge of 69 Pakistan internationals, winning 37, and losing 29, with three non-results. Previously he coached South Africa between 1994 and 1999, guiding them to the World Cup semi-finals.